State Superintendent of Public Instruction Jack O’Connell phoned the Pacific Grove Unified School District office to personally announce that Pacific Grove had been awarded a Distinguished Schools Award for 2009. The district’s innovative “Dot Program” was a huge factor. “This reflects on Matt Bell’s tenure as principal,” noted Mary Riedel, Pacific Grove Middle School principal. She was vice principal when the Dot Program was conceived in a staff conference involving Bell, Riedel, Todd Buller and Stan Dodd. Searching for ways to increase staff involvement with students on all levels, the administrators hit upon a method of tracking staff-to-student interactivity by placing a colored dot next to a student’s name each time a staff member had contact with that student. The goal is to ensure that each student, by the end of the school term, has at least three dots next to his or her name, in the belief that the more dots a student has, the more successful he or she will be. Problems, the staff believes, will be encountered and dealt with early in the students’ careers at the Middle School. Looking at the chart, which is kept on the wall in the faculty lounge, it would appear that staff at the Middle School has exceeded the goal of three dots per student. There, on bright paper with orange-colored dots, staff tracks interaction with students. 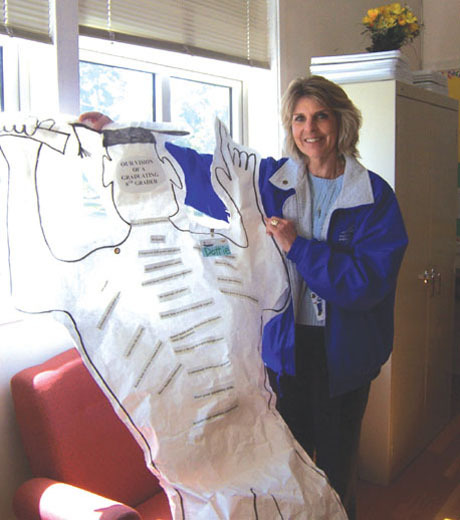 Also holding court in the staff lounge is “Dottie,” a hand-drawn, life-sized paper doll who sports a “blouse” made up of strips on paper, each of which holds a typewritten goal for staff to remember. She also sports the mortarboard hat of a successful graduate. Riedel says their “homespun” method of tracking must soon be polished up and made presentable, as the State has asked them to provide data so that the Dot Program can be shared. She’s searching for someone to help them establish a data base to track statistics. But the Dot Program is not the only factor examined by the California Department of Education. Laura Emerson of the school district office points out that, “Invitations to apply . . . are given to those schools which meet a variety of eligibility criteria,” including many federal and state accountability measures. Students also achieved overall success in reading and English language arts, and a math support program used by the Middle School increased the school’s “Academic Performance Index” a full 18 points, she said. “California distinguished Schools must meet the challenge of providing all their students with a rigorous education and to fully prepare today’s students for success in postsecondary education or the workforce,” said State superintendent O’Connell in a written statement. O’Connell visited Pacific Grove in February when he was here for a conference at Asilomar, the same day that the state’s review team was here visiting the Middle School. Schools selected are in the upper 10 percentile of California’s nearly 2,400 middle and high schools. Pacific Grove Middle School also won the award in 2001. The only other schools in Monterey County which won the award were Carmel Middle School and Carmel High School.